The Highlands of Scotland, the territory of rugged wilderness far north of cities Edinburgh and Glasgow, are often depicted in popular culture in one of two ways: A romantic backdrop with gentle rivers, rolling hills, and the occasional touch of fog (Outlander, anyone?) or a dark, brooding landscape where violence and danger may erupt at any moment (see Braveheart; also the Hogwarts Express train route of Harry Potter fame). 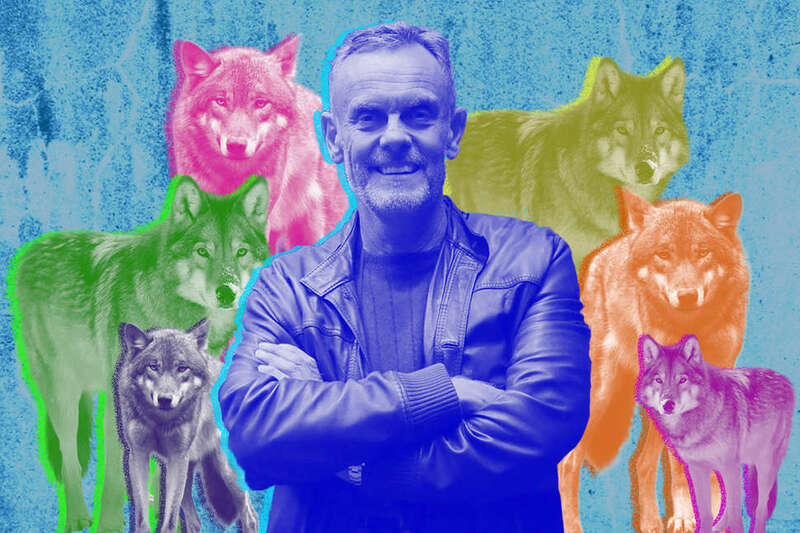 But one resort in the Highlands wants travelers, and even locals, to have a new mental image of Scotland: As a land supportive of wild fauna, specifically wolves. The Alladale Wilderness Reserve is a 23,000-acre parcel of open land in the central Highlands, about an hour and a half drive from Inverness Airport, the region’s only major airport. After you pass through the small village of Ardgay, the last town before Alladale, it’s another 20 minutes of narrow roads and quaint Scottish scenery before turning onto a worn-down gravel road that winds through the reserve. At the top of a small hill, a 19th-century Victorian-style lodge overlooks the Alladale’s western boundary, which is stacked with green hills, tall and short. A pair of deer can usually be found chilling under a large tree near the driveway. (Another one is mounted on the wall in the lodge’s entry.) In the early mornings, red squirrels dart to and from feeder bins near the lodge. The air is fresh and crisp; the scene is blissfully quiet. 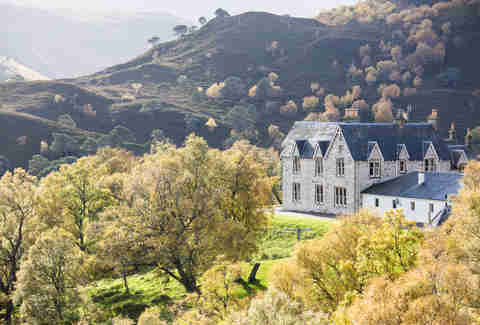 This seemingly unspoiled retreat in the Highlands is undeniably beautiful, especially for an American like me living in Los Angeles. But according to Paul Lister, Alladale’s owner, much of the land here is barren. “Scotland has this amazing image, long may it live, of raw natural beauty, but it’s quite unnatural,” Lister said matter-of-factly over dinner at the lodge in September. “So much of what you’ve seen driving up here, nothing of it is natural. 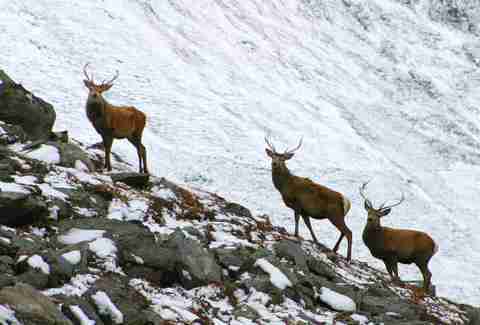 Nothing is how it was 500 or 1,000 years ago.” Centuries of wars, logging, cattle-grazing, and stalking (the British term for hunting) have destroyed the Highlands’ ecosystem. “We’ve sanitized our landscape,” says Lister. Lister, who purchased the Alladale property in 2003, is hoping to reverse the man-made destruction with several large-scale efforts to rewild the environment. Those efforts include planting trees (more than 900,000 so far), boosting the red squirrel population, restoring peatlands, creating a Scottish wildcat habitat, protecting the salmon in the rivers, prohibiting hunting, and eventually, introducing an apex predator that’s been extinct in Scotland since the 1800s: The wolf. Lister and his team at Alladale are hoping to follow a controlled wolf release strategy like that of Yellowstone National Park, which brought back the wolf population in 1995. Since then, the wolves have had a tremendous ecological impact on Yellowstone, largely in that they’ve stopped the elk population from constantly grazing on plants that other species need to survive. Even 25 years later, Yellowstone is seeing new positive effects of having a predator in the mix on both plants and animal species. Naturally, the idea of wolves running wild have made the locals near Alladale skittish. Opposition over the years has been plentiful, ranging from whether or not it’s feasible or manageable to reintroduce them, to whether Lister should even be the one in charge of doing such a thing. But as wolves begin to make a return to other parts of Europe like Germany and Italy, Lister believes wolves in Scotland may not be so controversial. Ideally, Alladale would like to release two packs of six European grey wolves -- controlled, tagged and neutered -- within a fenced perimeter at Alladale and a neighboring land, as a check to the deer population and their continuous grazing behaviors. The thinking goes that this will encourage tree and flora regrowth, trickling down to the species that depend on those plants for survival. Meanwhile, fencing off the area has also been met with some resistance by hikers who cite Scotland’s “Right to Roam” law, enacted in 2003, that states anyone can access any land, regardless if it is privately owned or not. Not only would the wolves affect the ecosystem, their presence would change Alladale’s business model. Right now, Alladale is very much a traditional Scottish lodge open to guests and small groups from April through December. Accommodations include seven rooms in the main lodge and two private cottages deep in the glens, where the only sound you’ll hear is the river out your front door. There’s another smaller, more rustic cottage in a different glen that’s even more remote, with no WiFi access or cell reception, just a landline. It’s here that extreme survivalist Bear Grylls hosts his three-day Survival Academy. Alladale is also a popular spot for other adventure retreats such as The Ice Man’s Wim Hof Method, cycling tours, yoga and meditation journeys, and conservation seminars. “But once we bring the wolves back, then the whole dynamic changes,” Lister explained, comparing the experience to a South African game reserve, where the wolves will be the main attraction for guests. This means room rates will increase, while more guides and tours will be offered. 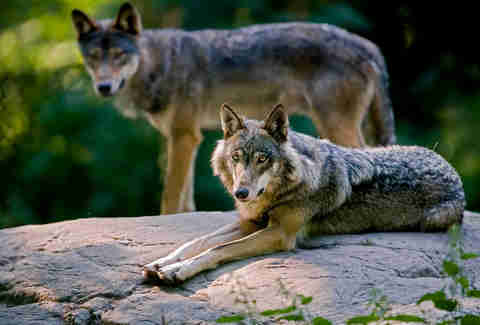 In short, wolves would create an ecotourism opportunity. To have wolves at Alladale would be the culmination of nearly two decades of Lister’s life spent rewilding Alladale. Indeed, reintroducing wolves to rewild the area was Lister’s sole reason for purchasing Alladale. But there was another reason at play too. Lister is the heir to Britain’s MFI Group, a quite successful furniture retailer in the latter half of the last century. There’s a funny statistic that’s often quoted about MFI -- at one point in the 1970s, 60 percent of British children were conceived in an MFI bed. But how do you make furniture? By cutting down trees. So Alladale can be viewed as Lister’s redemption story of sorts, his way of giving back to the land and making up for the sins of his father’s company. But Lister doesn’t see it as simply as this. Conservation is not some charity effort he does in his spare time. It’s his full-time job. In 2000 he established The European Nature Trust, which focuses on environmental and educational projects in Romania, Italy, and Spain, as well as Scotland. A small percentage of bookings made at Alladale go towards TENT to fund conservation programs at the reserve. Lister is also completely realistic about the fact that rewilding is a long-game, one that won’t be achieved during his lifetime, but rather a hundred years from now -- if things go well. “In the meantime, we go about doing our work here building the habitat and trying to build up the species list, and then trees grow and more butterflies, birds and bugs come back,” Lister said. Keeping in theme, Alladale employs sustainable living practices within the lodge and cottages, such as composting and sourcing local ingredients and services. An aquaponic garden is currently under construction. While Alladale works on its wolf pack, Lister said that he hopes visitors who come to Scotland for the golf courses, whisky distilleries, and ancient castles, also realize the importance of saving the land. Juliana Shallcross is a Thrillist contributor.